The first time I ever tasted a corned beef brisket was in Elmira, New York at a St. Patrick’s Day party in 1988. Many people asked if it tasted just like my mom’s corned beef. They were astonished to learn we don’t eat corned beef and cabbage in Ireland. In Ireland we tend to pair cabbage and potatoes with bacon. Our version of corned beef is an inexpensive canned deli meat. I am not sure if it is a step above or below Spam. 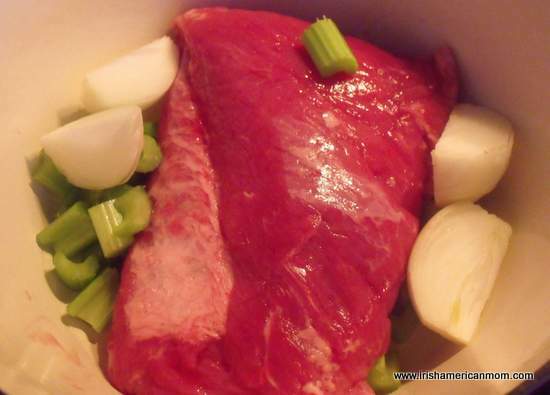 So where did the association of corned beef with St. Patrick’s Day come from in America. 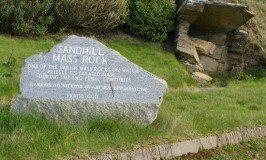 When Irish emigrants arrived in America they found that beef and salt were relatively cheap, so they started to cure beef just like they treated a “bacon joint” back home in Ireland. 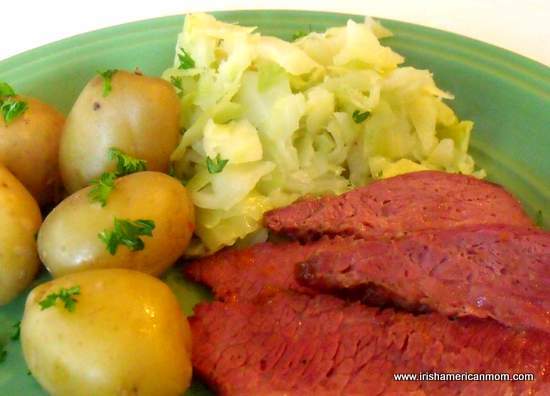 Hence corned beef and cabbage replaced Ireland’s traditional bacon and cabbage dinner. Bacon and cabbage was a weekly staple in our house. I always remember my grandmother sending me to the creamery to buy a piece of meat. “The man behind the counter saves the piece of bacon I like,” she advised. He never failed her. I would arrive back with a lovely pink piece of meat wrapped up in brown paper and tied with rough twine. She cooked it in an ever-boiling pot of water, bubbling on the range, tossing in shredded cabbage leaves about a half an hour before the meat was done. My West Cork grandmother was no fancy cook, but she made the best bacon and cabbage I have ever tasted. Since coming to live in America it is hard, if not impossible, to find traditional Irish bacon. Just like emigrants from years gone by, I have learned to substitute corned beef, but unlike my grandmother, I don’t just boil it. I make a sweet glaze with apricot preserves then finish cooking it in the oven, to add an extra layer of flavor. Place the brisket in a large Dutch oven, and add the chopped celery and quartered onions. Cover the meat with water and season with salt and pepper. Turn the heat to high and bring to a boil, then reduce the heat to low and simmer for 2 to 2 and 1/2 hours. A 3 pound brisket takes 2 hours and a 4 pound brisket needs 2 and 1/2 hours. Just before the meat finishes boiling pre-heat the oven to 350 degrees F and make the glaze. 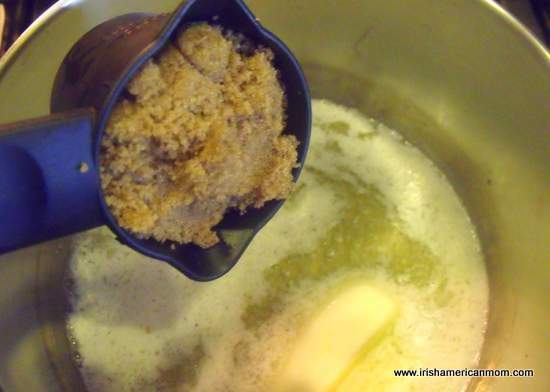 Melt the butter in the bottom of a small saucepan and add the brown sugar. Pour in the apricot preserves or jam as we say in Ireland. Next comes a tablespoon of worcestershire sauce. Then add two tablespoons of dijon mustard. Pour a 1/4 cup of apple cider vinegar into the glaze. And finally, powdered ginger adds extra depth of flavor to this sweet glaze. 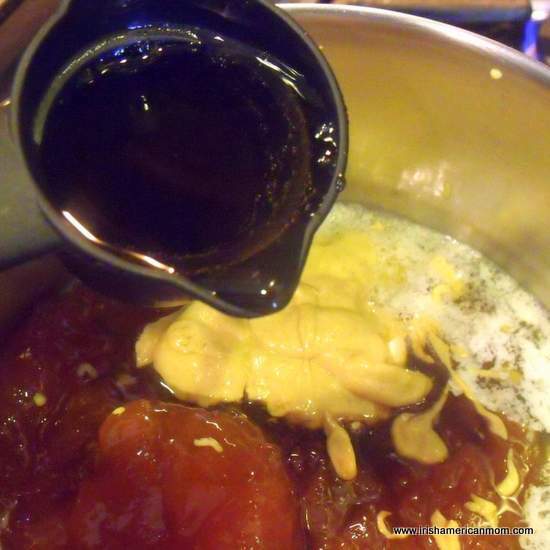 Whisk the glaze ingredients together over medium heat until the sugar and preserves dissolve. Remove the brisket from the Dutch oven and discard the cooking liquid and vegetables. Place the joint in a greased roasting pan. Pour the glaze over the meat. 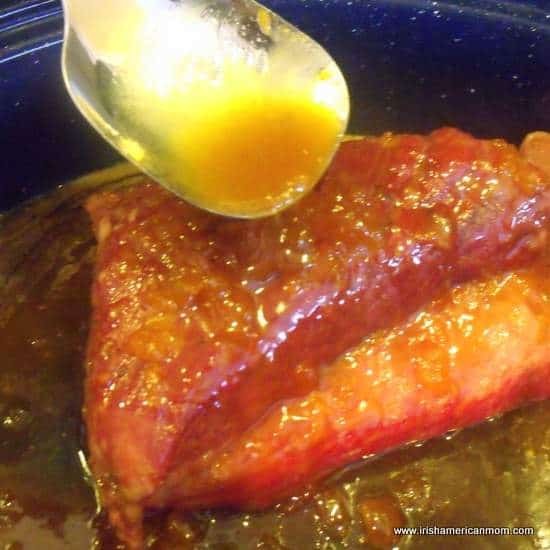 Use a spoon to make sure the surface of the corned beef is well glazed. Bake uncovered in a 350 degree oven for 30 minutes. Spoon the glaze from the bottom of the pan over the joint every 10 minutes during the baking process. Remove from the oven and let the meat stand for 10 minutes before slicing and serving. This resting time allows the meat juices redistribute and remain in the meat when you slice it open. Serve sliced corned beef with boiled cabbage and potatoes. This corned beef is not just boiled. Brushed with a sweet glaze of apricot preserves, cooking is finished in the oven, adding an extra layer of flavor. Step 1 Place corned beef brisket in a Dutch oven. Add chopped celery and onion. Cover with water. Season with salt and pepper. Bring to a boil, then reduce heat to low, cover and simmer for 2 hours for a 3 pound brisket, 2 and 1/2 hours for a 4 pound brisket. Step 2 Five minutes before the end of cooking time for the meat, make the apricot glaze. Melt the butter over medium-low heat in a small saucepan. 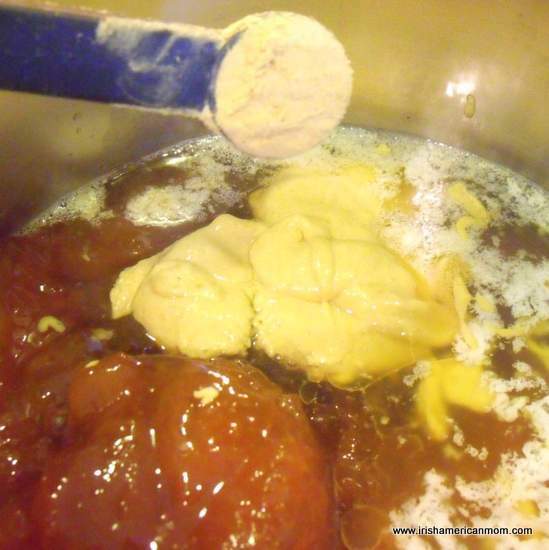 Add the brown sugar, apricot preserves, worcestershire sauce, dijon mustard, vinegar, and ground ginger. Stir over low heat until the sugar dissolves. Step 3 Preheat the oven to 350 degrees F. When cooked, remove the meat from the pot. Discard the cooking liquid and vegetables. Step 4 Place the cooked beef in a greased roasting pan. Brush the brisket with the apricot glaze. Step 5 Bake, uncovered for 30 minutes in a 350 degree oven. Every 10 minutes reglaze the joint by spooning some of the glaze from the bottom of the pan over it. Step 6 Once cooked, let the corned beef stand for 10 minutes before slicing. Step 7 Serve with cabbage and potatoes. 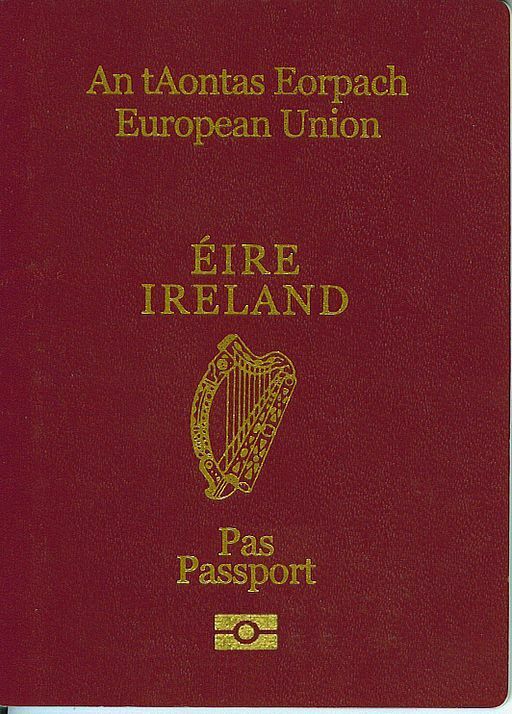 Wishing you all successful St. Patrick’s Day planning and cooking. 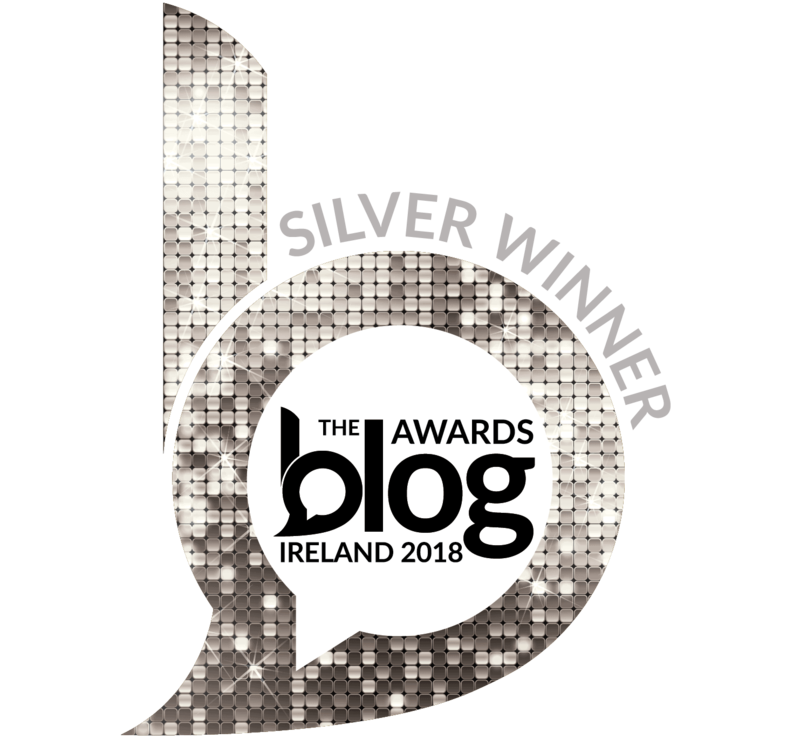 Did you see that I have an award for you on my blog? You might not “do” awards, I know that some people don’t, but I thought have you as being a “versatile” blogger! Also, I have little of a giveaway to celebrate my 100th post! Thanks so much for your kind recognition Kay. Congratulations on your 100th post. I really enjoy your writing so here’s to the next 100 posts. This sounds so marvelous! 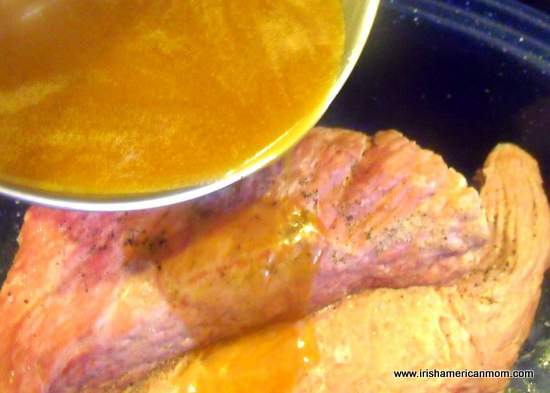 I just love authentic recipes such as this, and we adore corned beef brisket…must cook this! Thanks for the interesting history also! 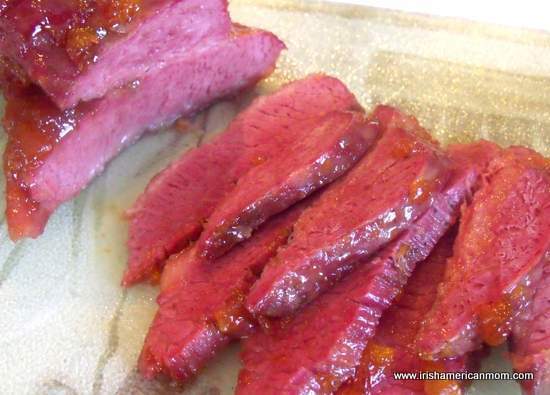 This recipe adds a lovely hint of sweetness to the corned beef brisket. Thanks for stopping by, Bonnie and checking out this recipe. I follow the recipe on the package. My mom says you have to simmer it longer. I’ve done that 3 years in a row hoping it will get tender. Hers always does? But mine iS always so tough its inedible. 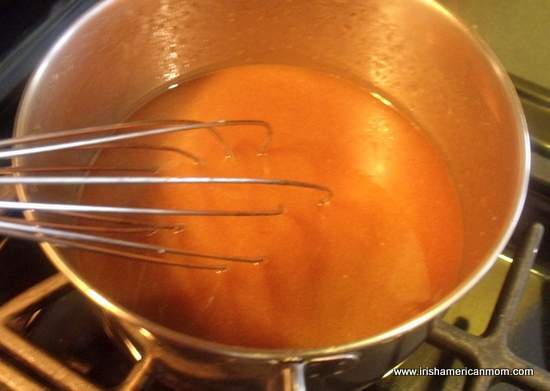 I simmer it VERy low…. And since I still have it in the fridge wondering is there any way to get it tender now? Happy St Patricks Day to all! Mary – You may want to try cooking your corned beef in a crock pot for 8 hours on low, before transferring it to the oven to glaze it. That might help to make it tender. I always find it is the luck of the draw when you buy a brisket. It is impossible to see through the packaging to tell if your piece has a line of gristle through it. Hope you enjoy your corned beef tomorrow. Best of luck with your dental surgery. Hope it is successful and that your recovery is quick and painless. I’m trying this recipe now. Corned beef is boiling. I tried something like this at my girlfriends a number of years ago, but lost the recipe. It was delicious and a hit with the family. Yours sounds even better though. She added rosemary to hers which I might do to yours. Rosemary sounds like a great addition. Hope it turns out good. Sorry Tish and I missed you at the parade. Blessing this St. Patrick’s Day…tomorrow. I am fixing your Apricot Glazed Corned Beef dish tomorrow with your cabbage recipe along with 10 Scotch Eggs and other items. If I don’t eat these kinds of foods from time to time, I probably won’t live longer…it’ll only seem longer. ;~) Wayne. Wayne – Sorry we missed you too. I waited at the starting point of the parade and joined the group after my little girl was safely sitting on the Irish Dancing Float. My three boys were with me, so we ended up lagging behind as we were handing out candy. They were delighted to be able to join in the fun. 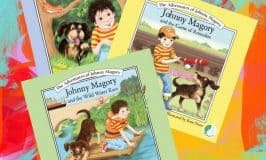 I hope you have a wonderful feast in honor of St. Patrick tomorrow. I think we all need to indulge in these “healthy” foods every now and then. Best wishes to you and yours for a very happy St. Patrick’s Day. 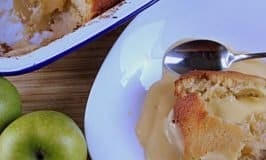 I found this recipe just recently and I have to tell you it’s fantastic and easy to make. Definitely a crowd pleaser. I made it for my family and neighbors and they all love it. 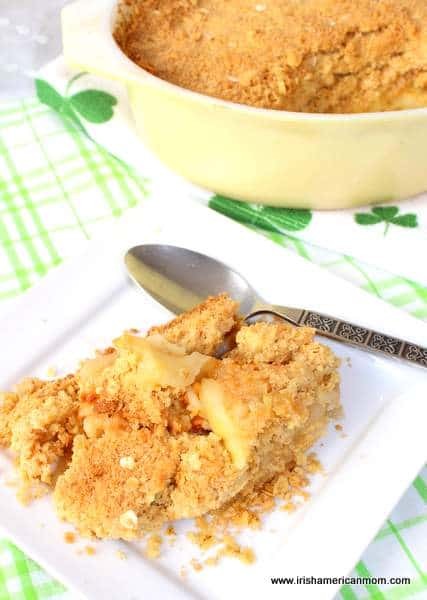 Aileen – Thanks for giving this recipe your family’s seal of approval. 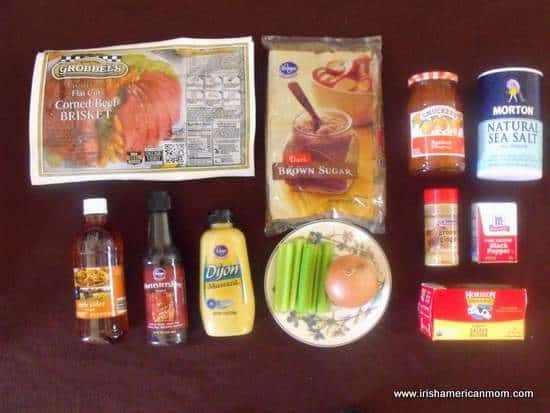 It’s always lovely to hear from readers who enjoy my Irish and Irish American cooking.